I am trained, and teach, in the Viniyoga style. Emphasis on the breath – linking breath to movement; using the breath to support and enhance movement, to energize, to de-stress, to refresh. Adaptations of poses for each individual practitioner – getting the pose into the person, not the person into the pose! In 1991, I was living in Manhattan (NYC) and jogged around the Central Park reservoir for exercise. When I became pregnant that fall, I had to stop jogging but still wanted to do something to keep fit. A friend suggested I try yoga, so I found a studio nearby that offered classes for people with physical limitations. I was hooked immediately. The stretches felt wonderful, and I always left class feeling calm and relaxed. After practicing yoga for a number of years, I decided I wanted to make yoga a more integral part of my life. I began investigating various schools of yoga, finally settling on Gary and Mirka Kraftsow’s American Viniyoga Institute (AVI), from which I graduated with a 500-hour certification in June 2006. In June, 2008, I completed a 9-month course in anatomy for yoga in Leslie Kaminoff’s Advanced Studies program at the Breathing Project in Manhattan. In April, 2013, I completed an additional 500-hour certification in Yoga Therapy with AVI and now offer private yoga therapy sessions and special classes for specific conditions in addition to my regular classes. I am registered as E-RYT500 (experienced 500-hour yoga teacher) with the Yoga Alliance and am certified as a yoga therapist by the International Association of Yoga Therapists. From 2011 – 2017, I taught classes at Aetna Insurance Company in Hartford, CT as part of a yoga for stress reduction program designed by Gary. The program was taught at Aetna facilities nationwide and I also served as the program administrator. 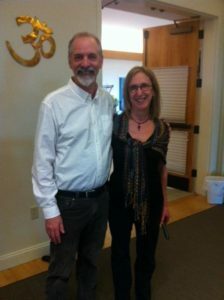 In addition to my local teaching schedule and private yoga therapy practice, I continue to assist Gary at some of his conference and workshop appearances and teacher trainings. I am a certified program leader for the Arthritis Foundation’s Exercise Program, and am also certified in CPR/AED/First Aid. Read about the current and upcoming classes! View the class calendar and see the weekly schedule. For your convenience you can buy individual sessions, 10-class cards, and cds of specialized practices right here on my site. For more information, I have compiled a webpage full of yoga resource links that I recommend.